Grab this Oil Dispenser Bottle FOR ONLY $1.10 with Amazon Prime and a code from the gleam at bottom of post! If you want to get the best value Glass Oil Dispenser Bottle, it is the right choice. and Finally, you will find this one is a must-have kitchen accessory. Automatic Stopper / Cap: Auto Flip Oil and Vinegar Dispenser, a new experiences of cooking. Eliminate spills and the oil won't drip or leak from the spout after use. Non-Slip Handle: It's comfortable to use! Thanks to its contoured plastic handle, Operate with single hand, easy to pick and place. Bottle made of transparent glass: the light can passes through the glass, It is easy to control the amount of oil and distinguish the different condiment oil. 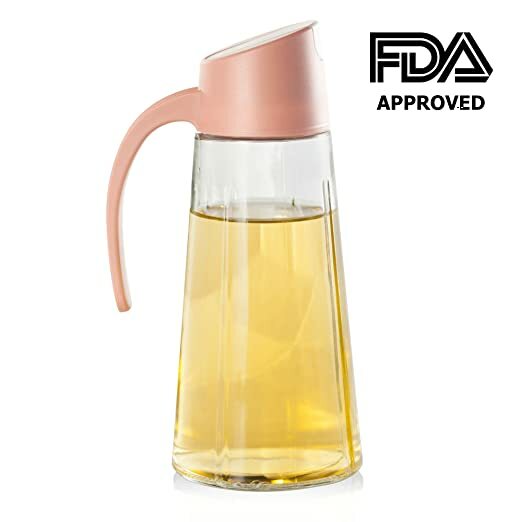 Thickened bottom: These oil and vinegar bottle has a thickened bottom for shock proof, with high quality, stylish appearance and innovatively designed. ★This Oil Bottle is Made of 100% lead-free glasses & Food grade PP, approved by FDA. this safe, eco-friendly vinegar bottle has zero aftertaste or smell. ★We're confident you'll love it. If you feel this dispensing bottles isn't doing the job, please let us know and you'll get a satisfactory answer. a. Please use boiling water to disinfect before use the bottle, wipe dry and put it in a clean place. b. Tighten the cap when using it to avoid the liquid leakage. c. After each use, Please wash dry thoroughly with sponge and soft cloth.